Today is my birthday! Happy Birthday to me! Yep, it's the big 5-0! But, it won't be official until 1:55pm, my actual birth time. Thank you, Thank you! I am a half century today. When I make a birthday cake or dessert for myself or when asked what I would like for my birthday, my two favorite choices are Red Velvet Cake and Banana Split Pie. Because it's so hot at this time in July, the Banana Split Pie usually wins hands down! Here is the recipe. I hope you love it as much as I do! In a 9x13 glass or porcelain dish, combine 1 stick of melted butter and graham cracker crumbs. With a fork, incorporate the butter until the crumbs are coated. Firmly press into a crust in the bottom of the pan. In a medium bowl, cream together the other stick of softened butter, eggs and confectioners' sugar; beat for 15 minutes. Spread evenly on the graham cracker crust. Layer banana slices evenly on top of butter/sugar mixture; layer pineapple on top of the bananas. 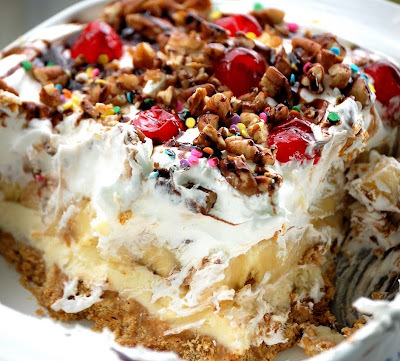 Evenly spread the Cool-Whip and garnish with cherries and pecans. Drizzle optional chocolate syrup over the top. Refrigerate at least 2 hours or overnight. Keeps well refrigerated for about a week. Happy Birthday, cher, and best wishes for a wonderful year ahead! Fifty is nifty and I've had more fun in my 50's than any other decade, except the 20's, of course! :) That cake is "to die for" and I can't wait to try it! Cheers! Happy Belated Birthday- this is a must make! I'll let you know how it goes! Jillian is going to be a HUGE fan! Can I use pasturized refrigerated egg product instead of raw egg? Happy Really Belated Birthday!! :-) Is it safe to use raw eggs not cooked? Looks amazing!! My aunt from Arkansas gave me this exact same recipe. Love it & have made it for years. Everyone in the family loves it, too.